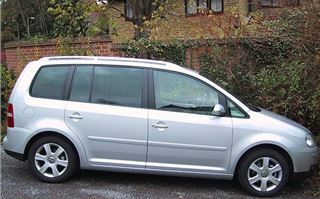 I didn’t notice the problem with the VW Touran until my second drive. The first had been in daytime through a town, involving parking in a car park and about 35 miles of motorway. But it wasn’t until the dark, wet night trip through the suburbs to a supermarket I became aware of the blind spots. The A pillars in front of you are so thick they create a triangular blind spot big enough to hide an approaching bus, never mind a cyclist or a pedestrian. 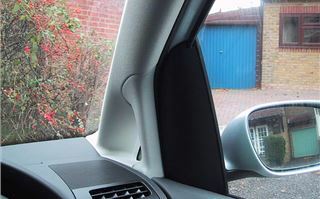 Sure they’ve put little quarterlight windows in them, but from the driver’s seat you can’t see through the one to your right so it might as well not be there. Check out the two pictures. 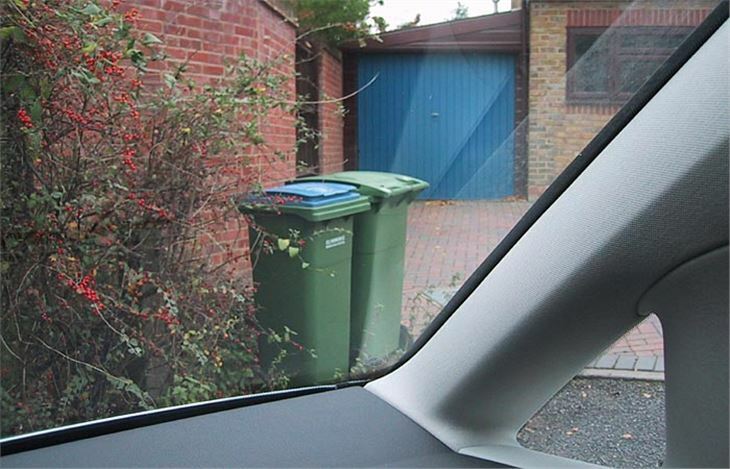 The car hasn’t moved, and those two green bins could be two people. Okay, those A pillars are part of the price of that excellent five star NCAP crash safety rating. And you can probably collide with a moose without getting decapitated. But they’re not so brilliant if they cause a crash in the first place. The rest of the car is petty good. 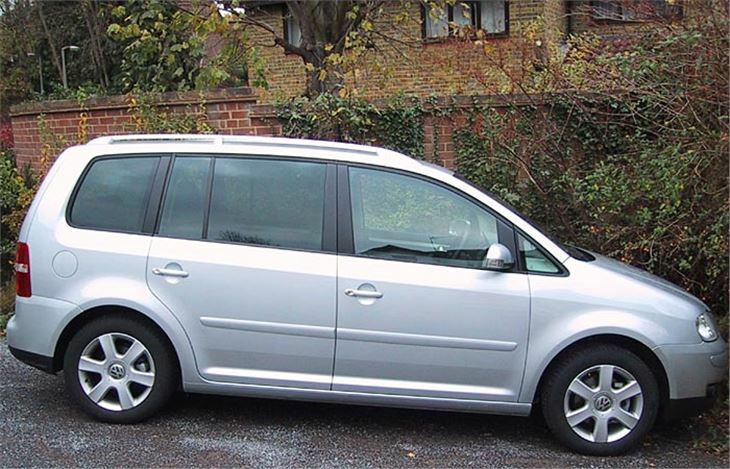 It’s a compact, Zafira-size 5 or 7 seater, though the extra two back seats are optional and suitable only for children. 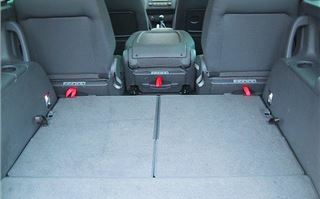 They fold individually into the floor, leaving a large, flat luggage space if travelling five-up. 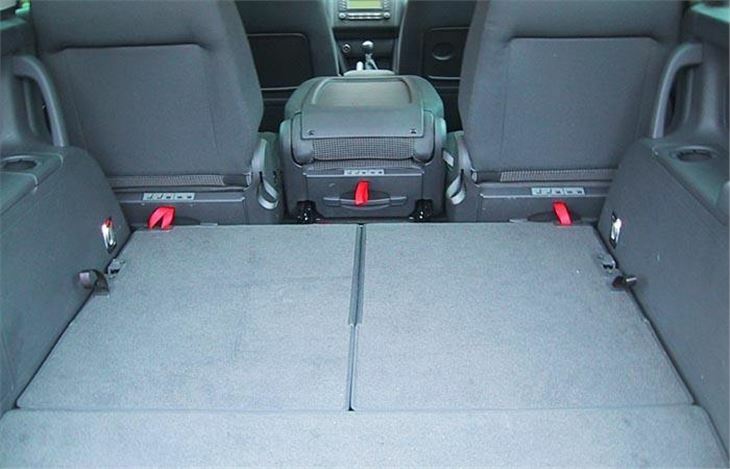 The remaining three individual rear seats can be slid forwards, folded or removed altogether, leaving a load volume of 1,913 litres. But with all seven seats in place the luggage area behind them will take no more than a couple of days shopping. There’s no spare wheel, and nowhere to put one. 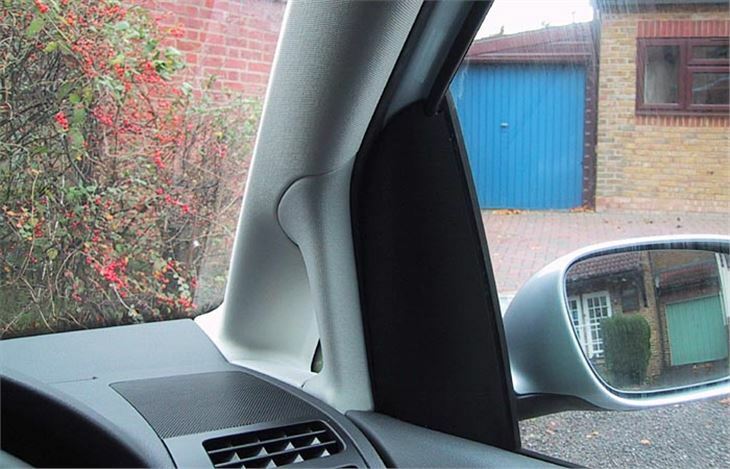 The seating position is multi-adjustable with a good range of seat height, steering wheel height and steering wheel reach, but, like the Zafira, not very much space fore and aft. If you’re like me you’ll find the seat adjustor rubbing the left leg of your jeans. But, though your leg movements on the pedals are more up and down than in and out, it’s comfortable, light, easy and pleasant to drive. 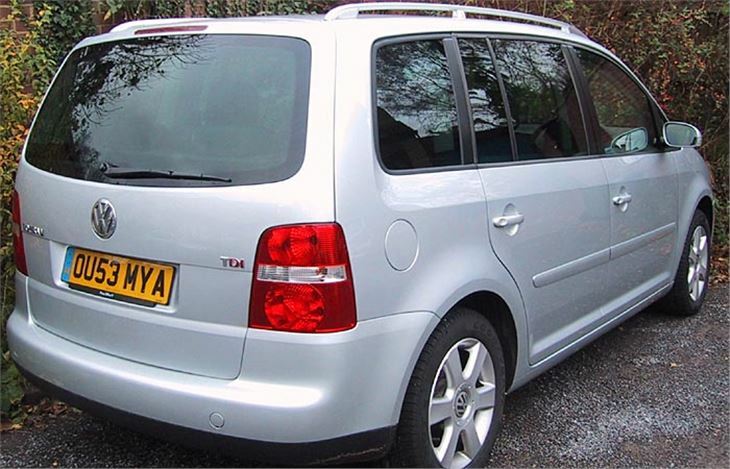 Mine had the new 2.0 16v 136bhp direct injected diesel engine, mated to VAG’s compact six-speed manual transmission through a precise, nicely-weighted cable change lever. 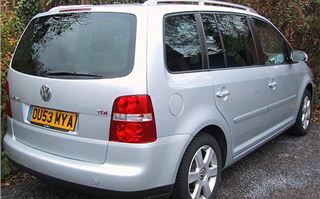 There is a gear for every eventuality and though 6th is quite tall at around 30mph per 1,000 rpm, it’s still flexible enough to be left in that gear on the motorway. 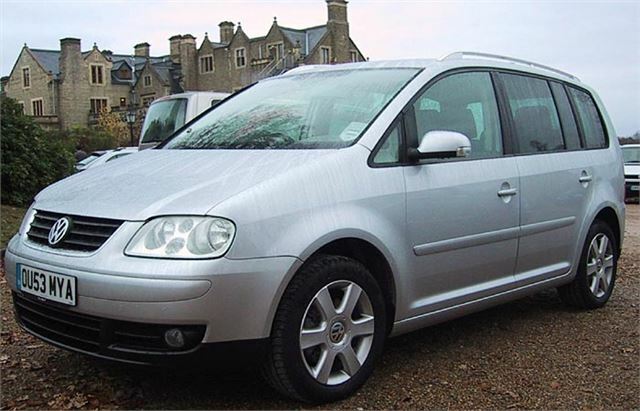 Ride quality is very good, at the expense of some roll understeer typical of small MPVs. It doesn’t handle badly, just not as well as a car with a lower centre of gravity. It has the new four-link independent rear suspension system used in the new A3 and forthcoming Golf V, with struts at the front. These struts are attached to an aluminium subframe itself fixed to the body at six points. The lateral control arms, anti-roll bar and steering are pre-assembled on this subframe during production, so that precise steering and suspension geometry is achieved. which is able to vary the feel of the steering wheel to suit the speed and driving situation: firm and direct when driving hard, effortless at parking speeds. Other advantages include mild self-centring action, the ability to compensate for different driving hazards such as crosswinds and steep road cambers, and a small benefit to fuel economy. Standard Electronic Stabilisation Programme (ESP) includes an anti-lock braking system (ABS), electronic differential lock (EDL), traction control (ASR) and Hydraulic Brake Assist (HBA). Thumbs up? Well the car I had was okay, but I can’t see myself justifying £19,000 for it. I suppose as a compact, smart school run kind of car it makes sense, and the 136bhp diesel engine is better than any available in the Zafira. 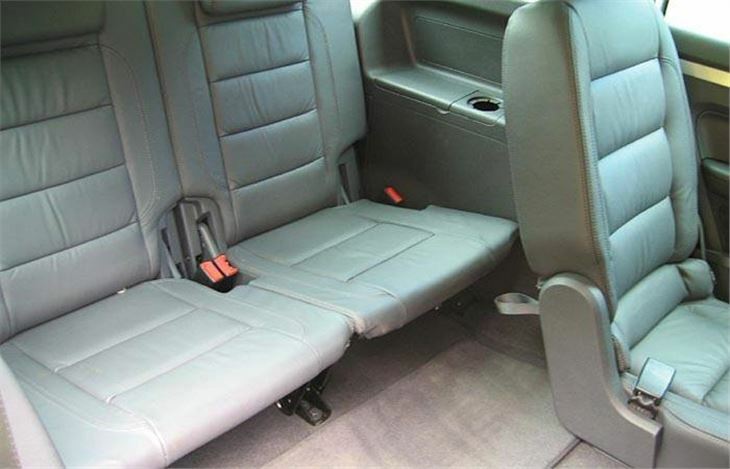 Its closest competitor is the new Renault Scenic 7 seater. But it’s very much a niche car and whether it’s for you depends on what niche you’re in.